Sunday afternoon my oldest was begging to go outside and blow bubbles. Now mind you, some of you may not know we are in the midst of an obscenely hot summer that threatens to melt your faces off each and every day, but we are and it’s miserable to me since the humidity has been steadily climbing. So I countered with an offer of going out after dinner when the sun is beginning to set and it is not quite so hot. After a dinner, during which Kidlet Two spills her plate not once, but twice, we proceed out to the backyard with bubbles being the highlight of the evening. 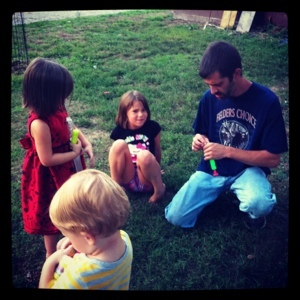 The kids had a blast playing with bubbles. We have one of those no-spill bubble containers with the giant wands so Kidlet Three was pulling out the wand and blowing while holding it about a foot from his mouth. Too cute! The girls darted back and forth between the swing set and the bubble station. I snapped a few pictures. At one point I asked them to get together for a group shot. This is what they gave me. But it reminded me how much simple experiences mean and how much fun it can be. I’ve been so caught up in the stressful parts of life lately and it was nice to step back a little and just enjoy the moment. It’s time to do that more often, I think and stay in the moment with the kids and the spousal unit. We’ll have to come up with another simple activity soon. What simple things do you like to do? After weeks of being the busiest I have been in some time, it just sort of hits me that balancing all the aspects of life is probably what makes all of it the most difficult. There’s work, home, activities, time with the kids, time with the spouse, time with myself, etc. The list just goes on and on. After a day at work, I come home and debate what all I can do before I fall comatose to my pillow. Do I try to write something even though I feel sluggish and mushy-brained? Do I do something relaxing? Do I try to clean up our pig sty? There are so many things competing for my attention that it is overwhelming and before I know it, I’m paralyzed into inaction. And I know this is something I need to work on. Picking something that I can accomplish and doing that. It’s the underlying philosophy of so much. But until last week, I felt as though I was walking around in a haze. It finally broke and though I am still tired in the evenings, I no longer feel immobilized by all the demands. I just need to tackle a few and get moving on those. Even if it’s just a little at a time.